Lifetime Animal Care Center’s experienced support staff strive to provide personalized, compassionate care for our patients and clients alike. Dana is originally from Pennsylvania and has lived in San Diego for the past 15 years. She received a Bachelor's Degree in Psychology from Boston University and a Master's Degree in Animal & Public Policy from Tufts School of Veterinary Medicine. Dana has worked in the animal industry for 13 years, with positions in animal sheltering, community spay/neuter, and zoo management, but her passion is veterinary medicine. Dana lives in Pacific Beach with her husband Torrey, her daughter Amelia, her rescue dog Armani, and Skylar the cat. Nicole is a Clairemont native and has worked in the veterinary field for two years. 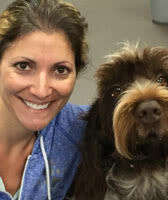 She has an Associate's degree in Social & Behavioral Sciences from Grossmont College and an Associate's in Animal Health Technology from Mesa College. In 2014, she received her Veterinary Technician License. Nicole lives with her family, which includes cats Beau & Cooper and dogs Opie, Miley & Willis. In her spare time, Nicole enjoys riding quads in the desert. Liz is a native San Diegan who received her Veterinary Assistant certification at Pima Medical Institute. She is currently attending the Veterinary Technician program at Pima. 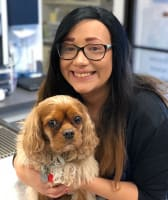 Liz has several years of customer service experience and is very excited to share her enthusiasm for animals and their human companions with the patients & clients of Lifetime! Liz shares her home with her daughter Kehlani and her black Lab, Phylow. When she’s not studying or working, Liz enjoys going to the beach, camping, hiking, and traveling with her family. A native San Diegan, Cassandra graduated from the Veterinary Assistant program at Pima Medical Institute. Her family includes her dad, sister, niece and 4 dogs. When she is not greeting patients and helping clients at Lifetime, she enjoys taking pictures, exploring different places and going to concerts. With a love for traveling and exploring new places, moving from Minnesota to San Diego has been an exciting new adventure for Talitha. She completed her Associate’s degree in Applied Science in the Veterinary Technology Program at Minnesota School of Business. Talitha has been in the veterinary field over 5 years. She is looking forward to sharing her home with future foster pets. Talitha enjoys spending time with her significant other exploring San Diego and other parts of California. 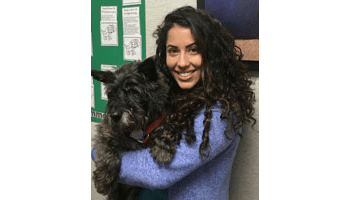 Originally from Chula Vista, Gaby attended Animal Behavior College for her Veterinary Assistant certification and she is currently studying Veterinary Technology. She has been in the veterinary field for 5 years. Gaby enjoys spending time with her daughter, Nayelli, and her Yorkshire Terrier, Jasper. She loves the outdoors and going for long runs. Gaby’s dream is to someday work with elephants. Originally from South Bronx, New York, Josh received his Veterinary Assistant certification from Pima. 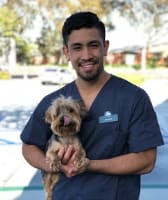 He has been in the veterinary field for 4 years and his family includes his mom, brother and 2 dogs Ginger, a Golden Retriever and Milo, a Yorkipoo. Outside of work, Josh enjoys working out. 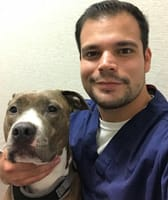 Dimitrio has been in the veterinary field for over 2 years and recently moved to San Diego from Temecula. He is attending Mesa College where he is majoring in Biology. Dimitrio loves to write and just finished a book. He also enjoys movies, playing piano and singing. His family includes his Pit Bull Arya, his cat Teru, and his three lizards, Ronan, Nova and Ryu. Elizabeth moved to San Diego from Alabama. 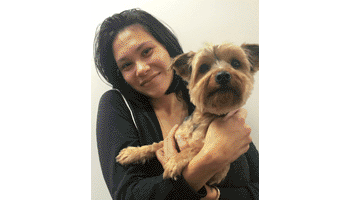 She completed her Associate’s Degree in Applied Science in the Veterinary Technology Program at Jeff State and enjoys spending time with her husband Jake, son Luke, and Shih Tzu Louie. 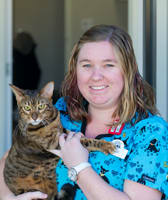 Elizabeth has been in the veterinary field for 9 years and is excited to be in California, which she loves to explore.